A movie with some great ideas, that just moves at a little too slow of a pace. There’s a cool storyline here, involving a kid with special abilities and the organizations and agencies that are after him. It’s both s chase movie and also a bit of a sci-fi mystery, and in all of those areas, it works. The big sci-fi moments are fantastic. But the pacing is a problem. This movie goes too fast in the first half and way too slow in the second half. It doesn’t hinder the film too much, because the story is so rich, but it certainly slows things down and gets in the way. 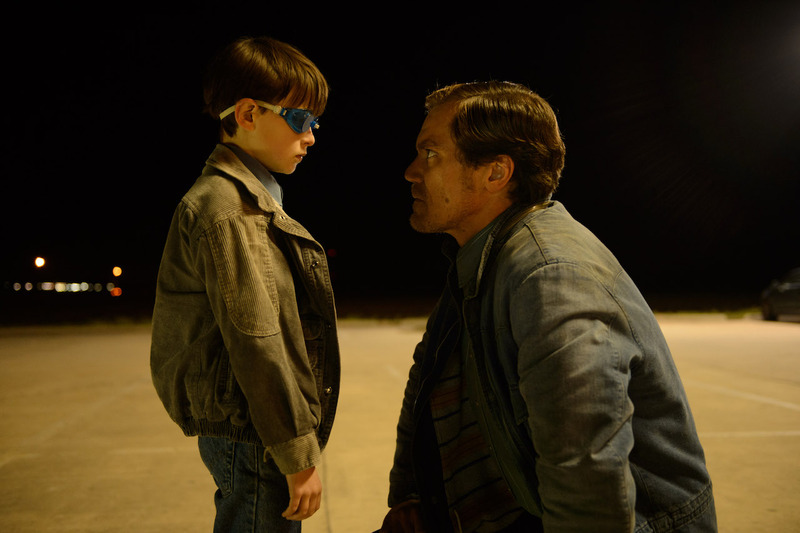 Midnight Special is a movie that takes somewhat familiar territory and finds new ways to explore it. We’ve seen plenty of movies about a single alien living among us. From Starman to K Pax to The Day the Earth Stood Still, it’s definitely s familiar type of film. We’ve also seen movies about a unique and gifted youngster, who can do things that adults can’t even comprehend, from Little Man Tate, to The Sixth Sense, to Mercury Rising.) 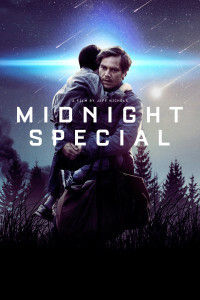 Midnight Special is a movie that combines these two genres. And it finds a way to do this that somehow makes the familiar paths feel kind of fresh and original. The only problem is that the pacing is too slow. With the first half of the movie, the pacing is actually just right. In fact, if anything, it’s too fast. That’s because it moves so quickly at times, that we often don’t get all of the information we need. What we do find out is that a boy (Alton,) has been kidnapped by his real father, Roy (Michael Shannon,) and taken away from a place known as The Ranch, which was a religious cult. Roy and Alton, are now on the run, and it is both people from the Ranch and the FBI who are after them. 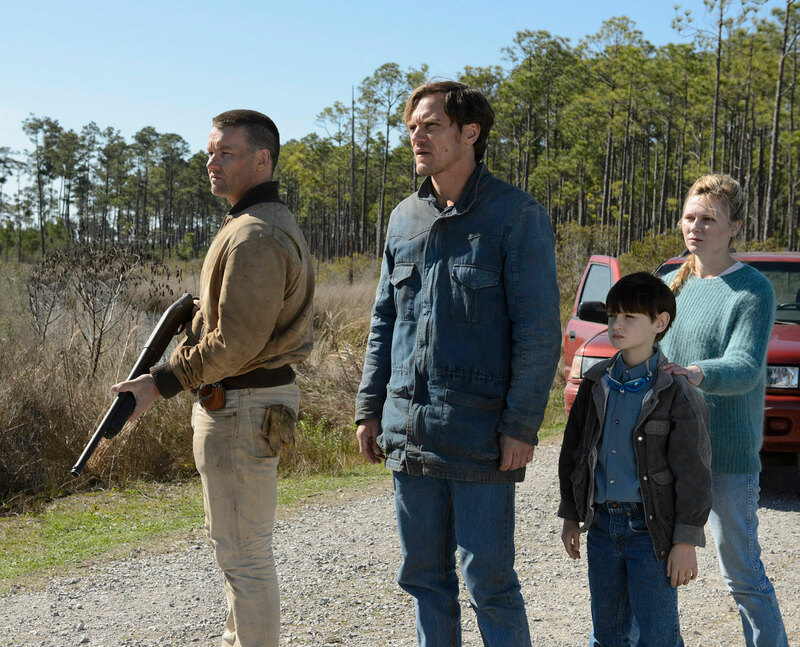 Roy and Alton are traveling along with Roy’s childhood friend, Lucas (Joel Edgerton.) when the movie opens, we are watching a television news report about how the boy has been kidnapped. An amber alert goes out. We pull back from the TV to see Roy and Lucas watching it from a motel room where they have the key hole all taped up. They wrip off the tape and look out to see that no one is in the hallway. Then they leave the room and run. From here we cut to an office room on The Ranch, where the man who is in charge (The Pastor, played by Sam Shepard,) is watching the news report as well. He’s watching along with two other men, and when the report ends, he instructs the men to go find Alton and bring him back. The people at the ranch believe that Alton is their savior, and the Pastor wants his men to work fast and find the boy before the FBI does. The Pastor now goes to conduct a sermon, and right as he’s getting started, men from the FBI bust in. They detain everyone, putting them onto busses to take them in for questioning. We sit in on the FBI interview with the pastor, where we learn that in his recent sermons, he has been reciting from passages whose numbers correlate with FBI security codes. The pastor claims that these numbers were given to him by the boy. Meanwhile, w check back in with Roy, Lucas, and Alton, on the run, and they are stopped and recognized at gas station. A park ranger holds them at gunpoint, and it leads to a shootout. From there, the three of them go into hiding with an old friend from the ranch, and it’s here that we get our first big, supernatural scene. It happens one night when everyone is asleep. Suddenly what feels and seems like an earthquake begins. Roy and Lucas bust into Altons rooms to find the boy shooting lasers out of his eyes and into the eyes of the msn who owns the house. When asked about it later, the msn responds by saying, I just wanted to see again. There are two other really cool moments in the movie. One comes at another gas station with what seems like a meteor attack. It’s actually lives of a satellite that fall out of the sky that fiery comets scorching the earth. The other moment comes at the end of thr movie, and I won’t spoil it here. I’ll just say that the film doesn’t hold back with it its climax. What it does hold back on is its back stories for the characters. We meet Altons mother, Sara, (Kirsten Dunst) for sample and never learn how she and Roy met, how Alton got taken from them both, or how she ended up leaving the ranch. fir every interesting scene, the movie alto sue has a lot of slow ones. There are plenty of moments that go by without a single person saying a word. The way that they are being hunted by two parties is cool, but the climaxes with both of them are less than exciting. Sure there’s a great and magnificent ending, but the movie sure did take its time to get us there. This film definitely has some good and interesting ideas, but it also has all sorts of problems with pace.